While shopping for bathroom accessories like faucets, sinks and towel racks may help to modernize the look of your space, it's the backdrop they're set against that will make the biggest impact. According to MySanAntonio.com, wallpaper has made a huge comeback to become one of the most popular choices in bathroom decorating. Some homeowners may believe that wallpaper can be used to cover the entirety of their space, but it may work even better on a smaller scale. One tip is to fill a wall behind your bathroom vanity - this can provide a versatile backdrop that you can use to incorporate matching candles, soaps and other accents. Most importantly, wallpaper has become much easier to put up and remove, so you could feasibly change it twice a year if you wish! Fabric wallpaper is the easiest style to work with and it can be found in nearly every style imaginable. 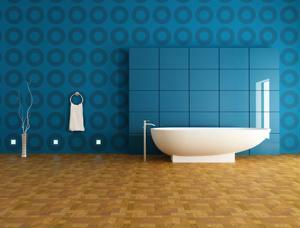 Wallpaper is a fabulous choice for those who are always looking for something different in their bathroom. How do you use wallpaper to its greatest effect in a washroom? There's no wallpaper in that picture?